There’s a reason why certain dishes become classics, and why we revisit particular flavor combinations time and again. 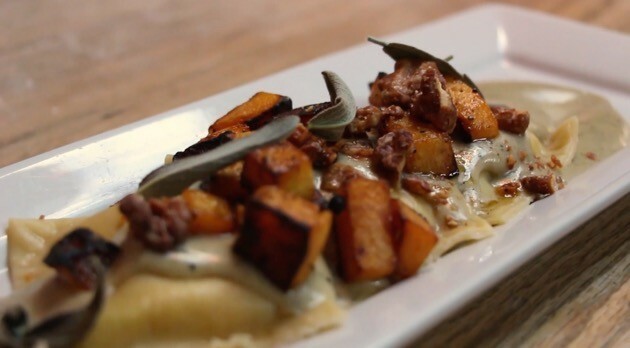 The pumpkin ravioli at 2Vine is an excellent example of both. This longtime fall favorite is getting the 2Vine treatment this autumn, wherein a simple – and admittedly sometimes tired – dish is reinvented as an offering worthy of the word “special”. In keeping with their commitment to quality, 2Vine is offering the pumpkin ravioli only as a special and not on the regular fall menu, owing to the limited availability of fresh, 2Vine quality pumpkins. Those lucky pumpkins that make it to the 2Vine kitchen are seasoned with traditional fall spices and wrapped in fresh, house made pasta, then tossed with a luscious brown butter cream sauce. The final flourish is a sprinkling of crunchy, toasted walnuts, which further enhance the seasonal flavor and add texture and dimension. Whether you love pumpkin or hate it, the pumpkin ravioli at 2Vine is well worth a try. These delicious little pockets of fall sunshine are a beautiful melding of sweet and savory flavors, with tender pasta and creamy sauce playing against crunchy walnuts for a dish unlike any you’ve had elsewhere. Rich, flavorful, memorable, this is a special worth waiting for, and an all around Best Dish – in season or out.